It’s New Years Eve and we are about to enter 2011. The past year has been one of tremendous success for the people of the United States… and tremendous failure for our representatives who are charged with the job of guarding our republic and protecting our freedom. Sure some progress has been made in our nations’ capitol, but it has only been to slow down the our plunge into tyranny. The victories we have seen show us what we, the people, are capable of when we get together and stand against our would be masters. We can sit back in satisfaction for having driven many of the worst offenders from positions of power. But… some remain and they are still determined to impose their will on the American people. If we do sit back and rest on our victories, they will evaporate like our jobs and our national prosperity. Remember the high so many of us felt on election night as we saw one after another of these big government types go down to defeat. That, and the work the legitimate foes of small government heading to Washington, is the payoff for our efforts. Not all of our favorites were elected… but supporting them was still worth our effort. Many of us have been in the arena, and have known victory and defeat… and many cannot go back to be merely an observer of the political scene. We have taken part in the struggle and shown the world, and the enemies of freedom that we are serious and we are in hot pursuit of their pernicious selves. This should be all the encouragement we need to stay the course, double our efforts, and bring our less involved friends and family along with us into the fray. So as we listen to the strains of Auld Lang Syne and seek divine guidance for the struggle that remains, let us press forward with more energy and determination than in the past. New Years Resolutions are fine for loosing weight or quitting smoking. However, when it comes to preserving our country for our children and grandchildren, we need to be acting with a conviction of the righteousness of our cause and the justice of our work. Happy New Year! 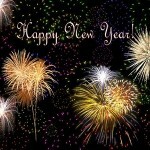 May you have a victorious 2011! Well said. I watched the republicans read the constitution on the floor of congress, and that is one of the most encouraging signs I have seen this year. We need to watch this new congress and give credit to, and support those people who represent us and our country. We also need to prune those people who bear no fruit.